Heavyweight 1/4 Zip Hood 18 oz. This great sweatshirt will last for the next 10-15 years. This is the best quality sweatshirt on the planet. Fabric: 18 oz. Heavyweight 95% cotton / 5% poly. 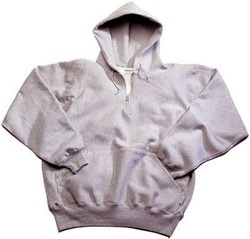 100% cotton sweatshirt face (outer shell). 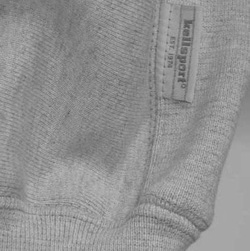 The 5% poly is embedded in the inside fleece backing of the garment. 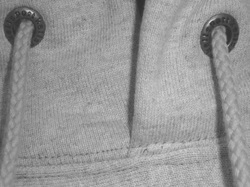 Very heavyweight reverse-weave crewneck sweatshirt. These are like the old college shirts from years ago. Heavy duty rugged fabric with stretch gusset panels on the sides. Long and comfortable cuffs, neck and waistband. These shirts will shrink about 10% on the 1st wash and dry only. The cotton will compact and the shirt gets even thicker (the cotton has to go somewhere).